Growing need and desire of present life style for energy has resulted in the depletion of natural resources as well as environmental degradation. When it comes to going green, renewable energy is one particular aspect to look into. Solar power, hydroelectricity – and of course, a wind turbine would be able to offer their fair share of contribution. Efforts to develop renewable resources of energy like solar, wind, geothermal, sea waves etc. to their best use are going on. Scientific and technological developments in the field of materials, nano-machine manufacturing, energy conversion efficiency etc. are helping to achieve new energy devices making use of even low energy output being generated from renewable energy sources. The axiom “a single water drop makes the ocean” stands true in case of energy generation as well as its use. Wind energy has been under consideration to be exploited as a suitable source of energy generation but wind turbines at present in use have many drawbacks like: big turbines, need of wind specific sites, non-regular availability of required wind speed, noisy generation, occupying large land areas as wind farms and many more. The peculiar appearance of wind turbines coupled with the fact they perform better when up high and out in the open sees them banished to uninhabited countryside, or even out to sea. Much as low wind generators would seem to be desirable environmental solutions, the reality is that power density rises as the cube of wind speed. Slow air just does not have enough power in it for much electricity generation. With all these limitations, there is a very negative view of wind energy in its present form. Scientists and engineers always explore every possibility and this time they have come up with an idea of wind tree for the generation of energy from wind with many advantages. From a distance this may look like an ordinary tree, but get closer and you will discover it is actually a power generator. Leaves of every tree in general and others like (Peepal) in particular, the slightest breeze makes their leaves rustle. The idea of the tree leaves rustling in the wind motivated scientists and engineers to think about the possibility of turning that kinetic energy into electricity. 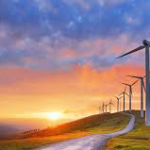 The energy provided by the wind is free, environmentally friendly and inexhaustible but current wind turbines are often considered too noisy, too large and change the view of landscape. Therefore, a tree-shaped windmill system whose leaves act as mini wind turbines is capable of providing power with autonomy and ecology. 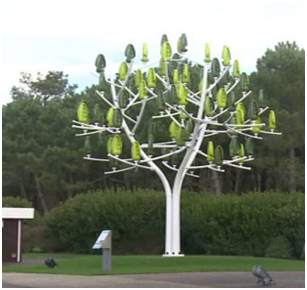 French company (New Wind) has created the Wind Tree, a 3-meter-tall generator designed for urban environments which makes the most of smaller air currents. 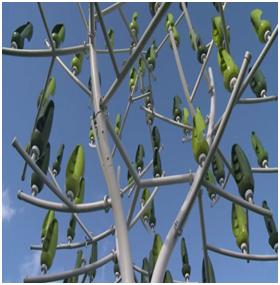 Operating in near complete silence, the wind tree consists of 72 micro turbine “aeroleaves” that rotate in the wind, generating an estimated 3.1. kW of power. The Wind tree uses tiny blades that are housed in the leaf units. The blades turn inwards, which enables the units to turn in the wind, regardless of wind direction. The current prototype of the tree is steel and the energy made from it goes into the electricity grid and can be used locally. This prototype, which weighs around 5 tons and costs roughly $35,000, is being used as an educational tool and aim to show the public the technology behind the structure. The Wind tree uses tiny blades that are housed in the leaf units. 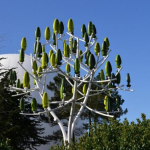 The wind tree will be mass produced for sale in 2015. The Wind Tree which promises to harness wind power while having a minimal impact on the local environment. The Wind Tree is small, aesthetically pleasing, silent, and requires very low wind speeds to generate energy. To make the device even more fitting for populated areas, they have been designed to look like trees. Although traditional wind turbines can generate 5-6 kW, their large size means they require strong winds to get moving, meaning they generate power for fewer days a year. Also, their huge size – towering up to 120 feet (36 meters) tall with the blade rotary diameter of up to 43 feet – means many find them an unattractive option. With artificial leaves serving as micro-turbines spinning on a vertical axis, the Wind Tree is designed to harness more gentle winds. The developers say this can extend to breezes blowing as slowly as two meters per second, making the turbine useful across more than 280 days of the year. Operation is said to be completely silent, with all cables and generators integrated into the leaves and branches. While this isn’t much compared to industrial-sized turbines, which typically generate in the region of 1 – 3MW, having multiple smaller turbines has its uses. Urban wind is not very strong, but it is very turbulent. These turbines need less wind to get started and produce around 3kW of energy, which could heat a small home, fuel lights or charge an electric car. Wind tree could either be hooked up to buildings via the main switchboard or connected to the grid with an inverter. Architects are interested in using them in their work, perhaps on the roofs of buildings. It is believed that sculpting wind tree in the form of an artificial tree could lead to wider adoption in urban centers, making use of low winds that circulate around buildings and streets. While The Wind Tree is slower to harness energy than larger wind turbines, it is actually able to generate more energy in the long run because it can operate more often and can catch wind at nearly any force. This sleek, stylish and aesthetic tree works most of the year because each leaf, equipped with technology aeroleafrotates when the wind reaches a speed of 2 meters per second (to run a conventional wind turbine we need at least 4 meters per second) whatever its direction, which avoids the phenomenon of shear . Producing 2.5 to 4 kWh, a 11 meters highwind Tree can meet the electricity needs of a family of 4 (excluding heating). The branches and leaves can be replaced giving it a lifespan of ten years. In future we hope to see such technological innovations flourish near us that will take advantage of wind’s renewable energy. There is need to optimize the structure and to make the leaves out of eco-friendly materials so that to have as a low a carbon footprint as possible. The Wind Tree may not be affordable and practical for everyone, but there can be other applications that could be more accessible. The technology makes use of mini wind turbines (the aeroleaves) which can have other applications also. Mini turbines are cheaper to produce and buy than the wind tree. Other ideas for the aeroleaves include rooftop foliage installed on buildings, foliage on roadsides and the smart balcony – where the mini turbines are attached to balcony railings. It is believed that wind tree will prove to be profitable after only a year of average wind speed of 7.8 mph. It is hoped that the Wind Tree will be a valuable addition to people’s home, gardens, shopping arcades and parks. The electricity generated will likely be enough to power LED street lamps as well as charging stations for electric cars. In the future, this technology can be combined with other energy harvesters such as solar panels and so on.